Dilute the 200 ppm iron standard to yield a 10 ppm working stock. To each 5 mL sample, add the contents of one FerroVer iron reagent powder pillow, shake and let stand. Below is an image of all of the calibration solutions after adding the powder reagent. In the colorimeter plotting program, select the blue LED and ppm as units. Calibrate the colorimeter with the 0 ppm iron solution and measure absorbance of all of the solutions in duplicate. Calibration curve measurements were repeated three times with 3 new working stock dilutions. Data for each of the three separate calibration trials are attached at the bottom of the page (hach_trial1.txt etc). To view this data, download the files and open them in the colorimeter plotting software as described here. 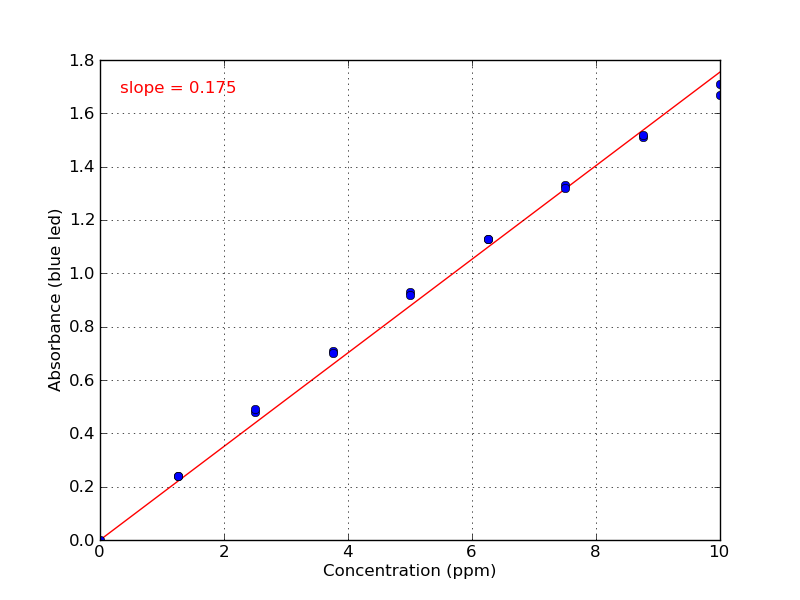 An image of the data from one of the calibration curves is also shown below.